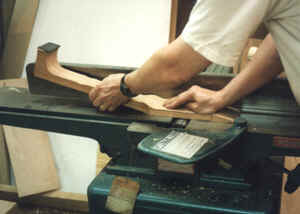 Here I am using the jointer to face off the peghead. 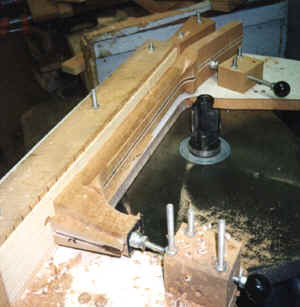 I use the bandsaw to establish the basic angle and this just smoothes it off and establishes the distance from the end of the fingerboard to the beginning of the angle. Here I am using the spindle shaper to rough out the neck shape and size. 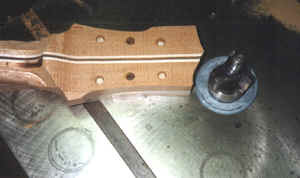 The jig is shaped to match the taper of the fingerboard and the shaper has a ball bearing rub collar under the cutter which follows the shape of the jig. 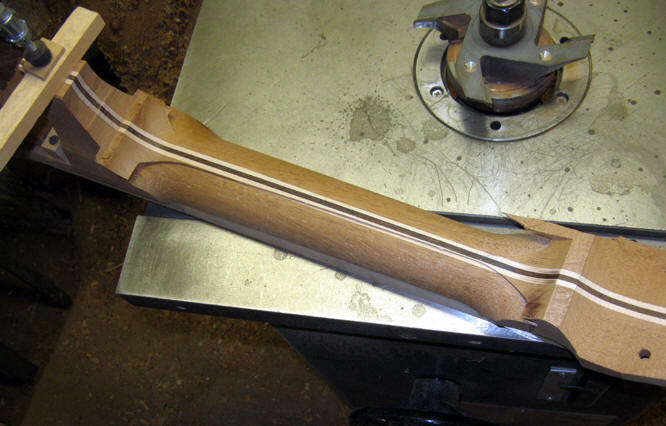 The purpose of this step is not to final shape the neck - I still enjoy doing that by hand. This removes a lot of the extra wood and simply makes the job easier. 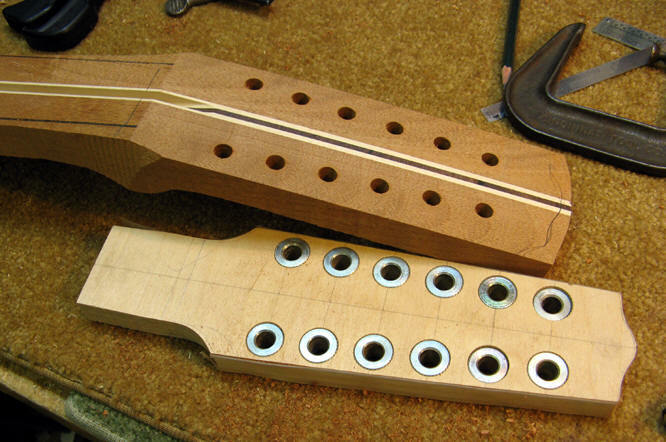 It also makes the pre-tensioning of the truss rod more effective- as described below. 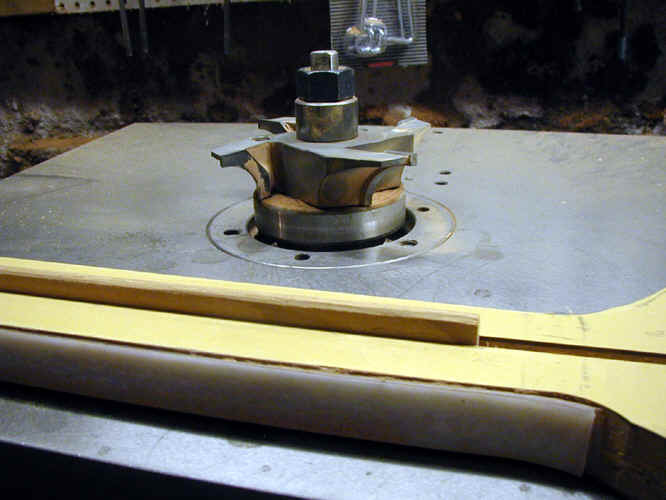 I have a new cutter for my shaper that does some preliminary rounding of the neck - not a final shaping but simply a bit more rough stock removal. The cutter is very smooth. 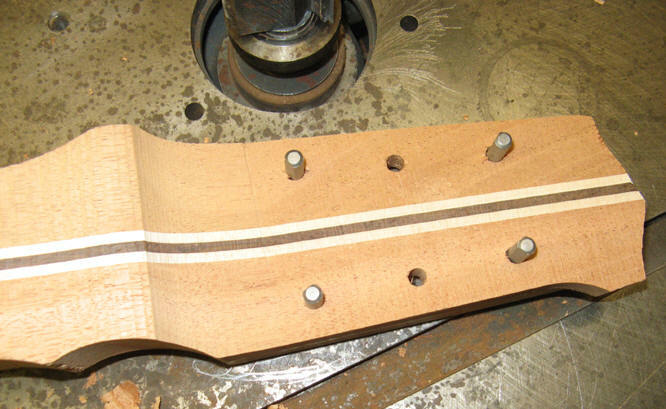 This is a similar step which establishes the basic thickness of the neck. 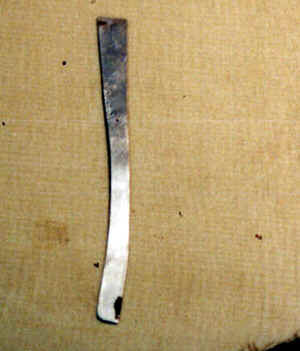 This is a simple tool - a small piece of aluminum shaped like the sides of my neck's heel. 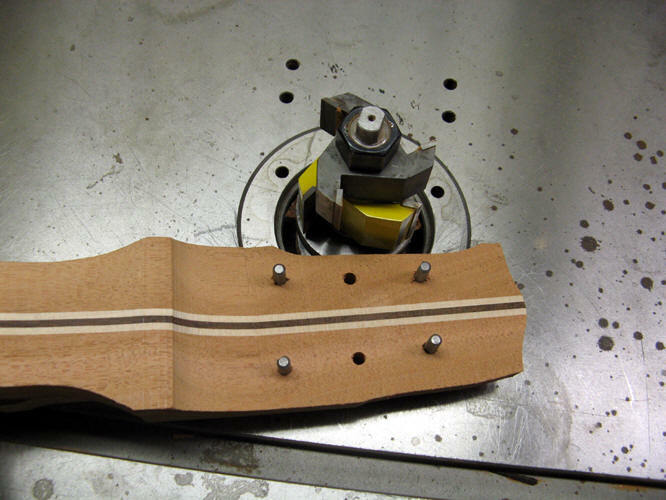 I mark the edges of the heel at the top (fingerboard ) and the bottom (heel cap) and use this to draw the line between them. 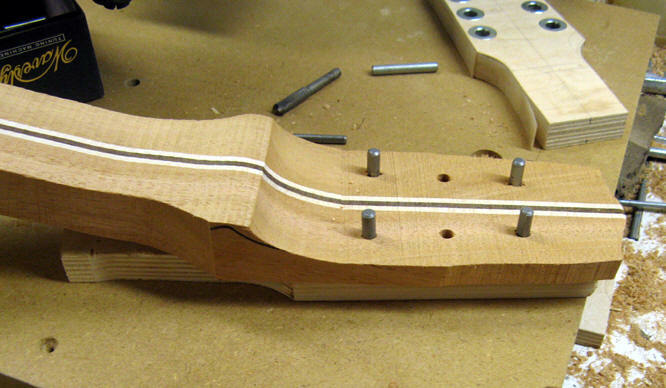 I use a lot of small templates or marking jigs like this - they help to keep the appearance of the guitars uniform. Next the peghead. 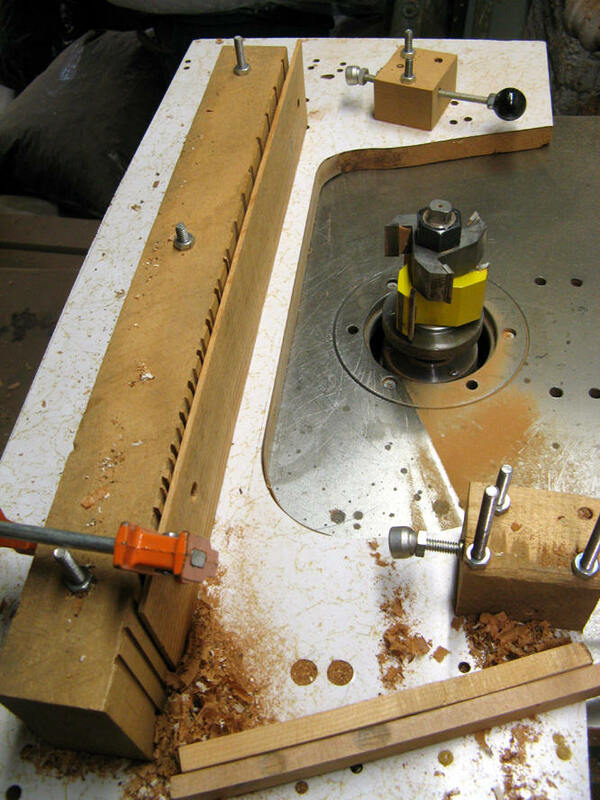 This jig is designed to aid drilling the holes for the gears. 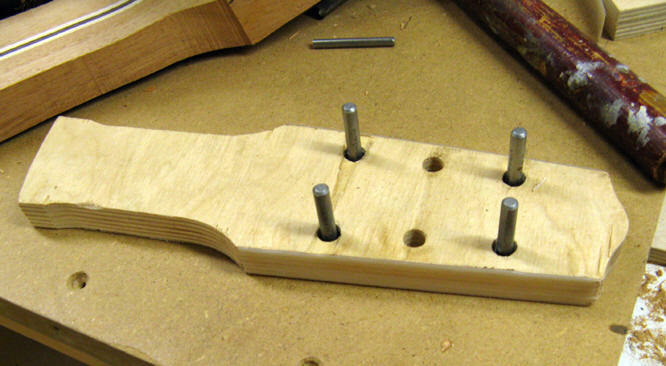 It is made of Baltic birch plywood and has metal drill bushings. It is carefully located on the neck and clamped with two clamps. 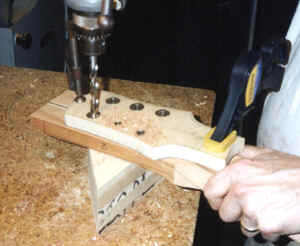 I then just drill through with my drill press. 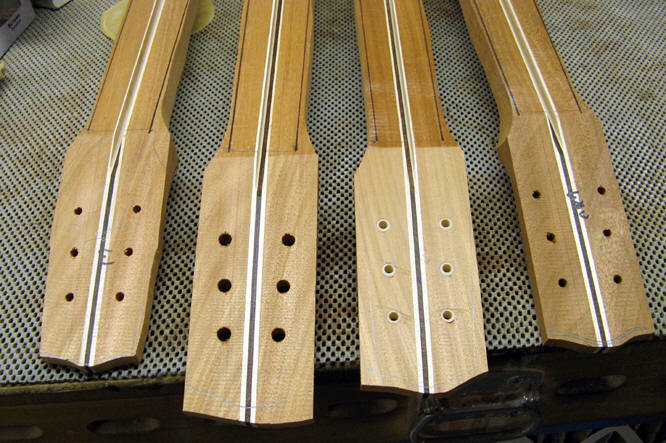 Another photo of the drilling jigs. After drilling the holes for the gears I bandsaw away the excess wood. Sometimes the wood is a bit small for the peg head and I glue on "ears" to allow for the full width of the head. Pegheads faced off and ready to shape. These are jigs I use to shape pegheads. 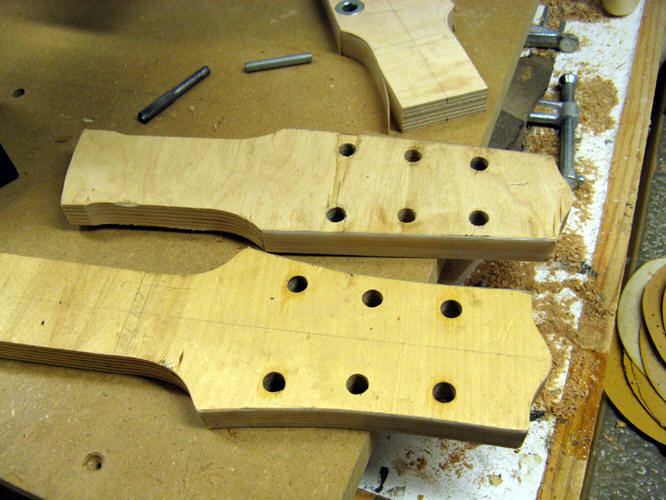 I fit metal dowels into the holes which then match up with holes in the peghead and hold it rigidly for shaping. The next step is to final shape the peghead. Again, I use the spindle shaper. This jig is for the shape I use on my D shape guitars. 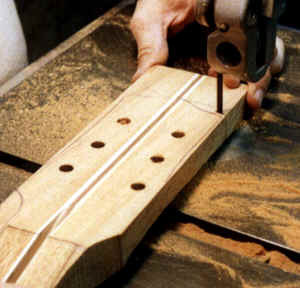 It has dowels that fit in the holes drilled earlier, and is automatically located perfectly - centered and the correct distance from the end of the fingerboard. these days I use metal dowels instead of wood. 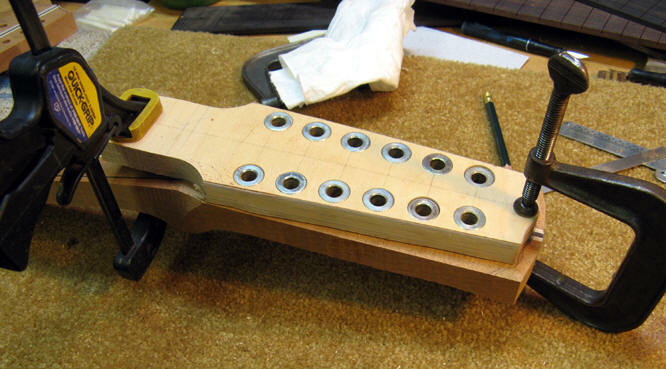 One reason is that I can use a stepped dowel (3/8 AND 1/4 ") so that one jig can work for both enclosed machines like Gotoh which use a 3/8" hole and for Waverlys which use a 1/4" hole. 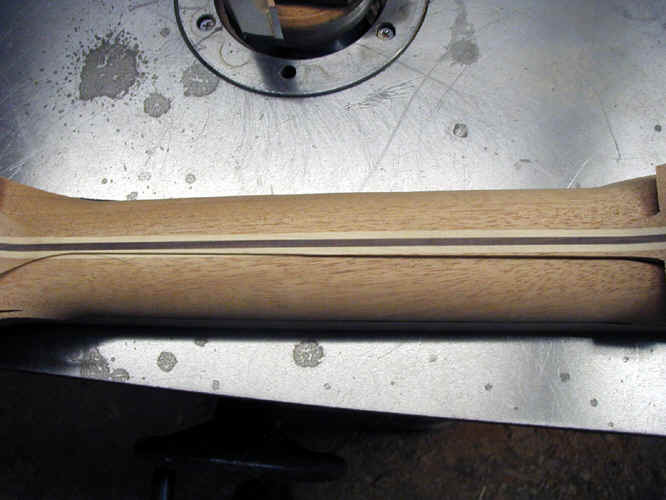 These dowels are for a Waverly style machine. Here the shaping is about half done. 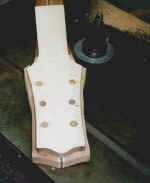 This jig thicknesses the neck blank. 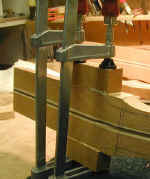 This jig - and cutter - rough shapes the neck - not to absolute final shape but close and quickly removes a lot of wood. Leaving this blank - which has almost all of the machine work done.